South Luangwa National Park: Africa's best safari destination? A couple of years ago, our Serengeti safari guide pulled up suddenly beside a patch of long grass, cut the engine on our jeep and gestured with glee towards 2 o’clock. “There! There”, he shouted, “you see?!”. The jeep’s roof popped up and we scrambled to take a corner and scan the plains before us. Eyes straining against the harsh midday Tanzanian sun, eventually Mark was first to spot a nearly imperceptible pride of tawny lions. We were so absorbed by the sight of these apex predators creeping stealthily towards dinner - a plump herd of Zebra grazing nearby - that we didn’t take any notice of Joseph on the radio. No notice, that is, until 15 beige jeeps screamed to a halt alongside us, full of khaki-clad Nigel Thornberry-esque tourists waving selfie poles and zoom lenses in the air and shouting to each other like they really didn’t care. Startled by the commotion, the animals made a hasty escape and we were left feeling pretty unsatisfied by our Serengeti experience. Going on safari is super cool. What’s decidedly uncool is having to deal with the armies of jeeps and hordes of tourists in the big parks that sometimes make it feel more like a theme park with little care for the wildlife you’re there to see. Luckily, we know a place off the beaten tourist track, without the camo-crowds, where you can still see Africa like Attenborough - and we know you’ll love it as much as we did. Introducing, Zambia’s South Luangwa National Park. 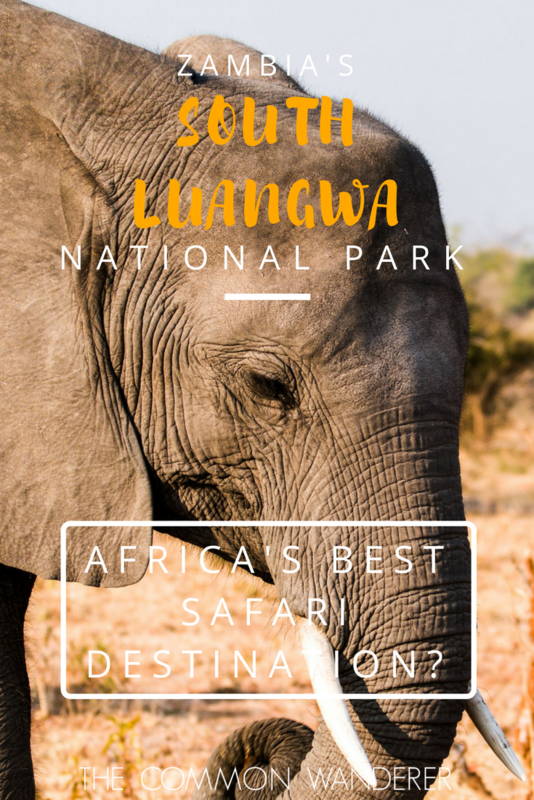 WHERE IS SOUTH LUANGWA NATIONAL PARK? The jewel of Zambia, South Luangwa National Park is about six hours from the capital Lusaka. It’s not the easiest destination to get to, generally involving a bus from Lusaka to Chipata then taxi to Mfuwe Gate (and until recently much of that way was unsealed roads!). But nothing good ever came easily, right? We really believe that the difficult journey absolutely works to the park’s advantage in keeping things authentic! WHAT IS THERE TO SEE IN SOUTH LUANGWA NATIONAL PARK? We have to preface this with the fact that we came to Africa with a vital mission: to see as many Leopards in the wild as we possibly could. We only discovered later that the area is named ‘Valley of the Leopard’ - and we saw 14 during our time there. Mission very happily accomplished! Beyond leopards, we saw a huge variety of animals. The park is probably half the size of other parks like Kruger but it has way more animal density and is world-renowned as a wildlife haven. Expect to see many of the aforementioned leopards, along with every kind of game, lions, elephants, the rare Thornicroft giraffe, hippos, vervet monkeys, crocodiles, and buffaloes. It’s all about the safari life here in South Luangwa National Park! The best time to see animals is morning or evening, which means you’ll also have the fortune of witnessing a classic African sunrise or sunset. Honestly, you’ve not lived till you’ve seen that crimson ball of fire rise above the plains! The best part? You’ll barely come across other tourists or jeeps during your time in the park, and you don’t need to pay over the odds for the pleasure. In fact, our South Luangwa safari was the cheapest we’ve ever experienced, and was absolutely the best value for money of them all. South Luangwa National Park is also one of the only places in Africa which allows walking safaris. Real ‘walking through the wild savannah where lions and leopards roam in the morning light’ style safaris! This is a once in a lifetime kind of experience, and definitely one of the best things we did on our year-long world trip. 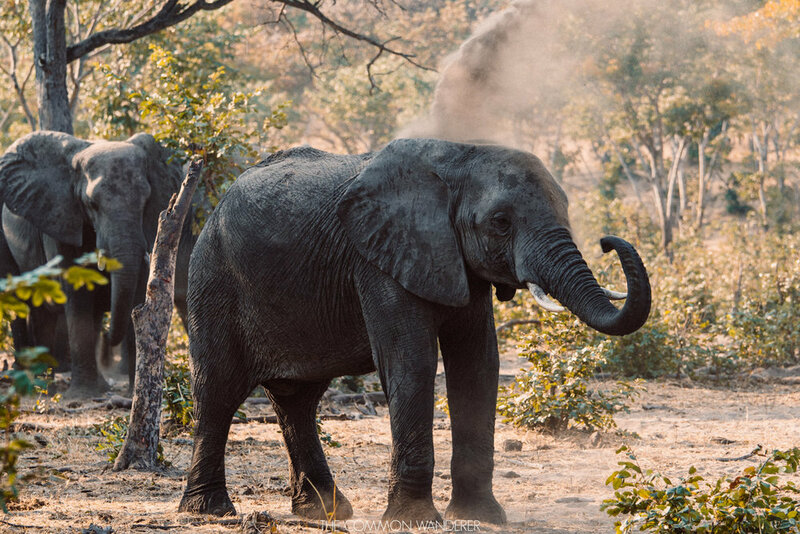 South Luangwa’s tour guides are known to be the best in Africa, so as you head deep into the park, you’ll learn a tonne about African eco-systems (just ask us anything about animal tracks or dung now!). While you’re not actually likely to come across an apex predator on your walk, it’s still extremely humbling to see the wild animals congregating on the banks of the beautiful Luangwa river nearby as the day begins. Evenings in Luangwa are best enjoyed with a sundowner and chats with new friends whilst listening to the sounds of hippos grunting as the sun sets over the Luangwa River. Travel dreams are made of this! Game drives start from $40pp USD, walking safaris from $40pp USD, and can be organised through Croc Valley. OKAVANGO DELTA VS CHOBE NATIONAL PARK - WHICH BOTSWANA SAFARI SHOULD YOU CHOSE? There is a tonne of accommodation to choose from in the region, from camping on the Luangwa river to luxury tents with air-con, or self-contained chalets to 5-star luxury lodges. The best part is everything is so close to the park that you can be picked up from your accommodation and whisked into the park on safari in less than 10mins. Given our rather limited 'long term traveller' budget, we opted to stay at the comfortable Croc Valley Camp, right on the banks of the Luangwa River. Croc Valley has a range of accommodation options, from Chalets, River tents, rooms, or camping. Prices range from $10 USD for a safari tent with no ensuite – $240 USD for a luxury riverfront tent. We opted for the dorm room, which was great. Croc Valley also has one of the best bars in Africa. Wide open views across the African plains, and with the Luangwa river below, you can enjoy a sundowner while listening to the groans of Hippo's below. To book Croc Valley, or read reviews, click here. Given the proximity to the park, don’t be surprised to see a herd of elephants wandering slowly through the grounds of your hotel, or some cheeky monkeys attempting to steal the food from your campsite. Even your accommodation is the perfect spot for up-close wild African animal experiences! Dry season runs from April to October (the hottest, and most concentrated animal viewing time! ), so we recommend visiting then. Apart from the incredible game viewing, the sunsets over the park are something to behold. Be warned, sunny days but cold nights are the order of the day during winter from May to August, so be sure to pack some warm jackets - game drives aren't too fun when you're completely frozen. South Luangwa National Park is tough to get to. Don't let that deter you though, as it is well worth the effort. From Lusaka, your best bet is via Bus to Chipata, and taxi to Mfuwe (10 hrs) or to fly directly to Mfuwe (2 hrs). Buses operate daily from Lusaka's Central, or Inter-city bus terminal to Chipata, and generally leave at around 5am. Tickets cost around $20 USD, and should be purchased prior to the day of departure, as buses do sell out. The bus journey, like most in Africa, is generally long, hot, and cramped, but a real experience. The bus will stop frequently at local towns for toilet and food breaks. We recommend travelling with Johabie, who have the best safety record. Mfuwe Airport recently achieved international status and various airlines were looking at scheduled flights from abroad. Proflight Zambia is the only airline flying scheduled domestic flights in Zambia. They fly daily to South Luangwa and Livingstone from Lusaka all year (frequency increases in high season). read more: our visit to the wild heart of Tanzania. South Luangwa National Park Fees: $25 USD per person, per day for international tourists. Find out the full rates here. It might be a little off the standard tourist route, but we promise a South Luangwa National Park safari is up there with the very best African wildlife experiences - and there’s barely a selfie pole in sight!